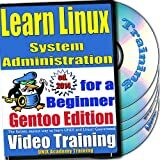 Shop for Gentoo Linux software. Do you need to learn Linux System Administration and pass the Certification fast? A major obstacle for newcomers to Linux is the steep learning curve of command-line workflow and scope of subjects to be learned. This set is designed to be a solution! This complete training and certification solution provides the motivated beginner system administrator with everything needed! Do you need learn it fast and deep for an interview? This concise, efficient and carefully selected program covers all major issues of Linux System Administration. This complete set includes: Training Video DVD, Linux Installation DVD, Linux Training Library CD, printed Quick Reference Card of Linux commands and Certification Exam by UNIX Academy (online). "Learn Linux System Administration" is an outstanding training and self-education resource that allows you to learn the most in the shortest time. This suite contains full version of renowned express course and the opportunity for UNIX Academy Certifications. This course is built around design features common to all Linux flavors and applicable to RedHat, CentOS, Fedora, Mandriva, Oracle Linux, Ubuntu, Debian, Mint, SuSE and all other distros. This course offers the chance to build a strong background in the Linux System Administration. This is administrator level course and presumes that user possess essential knowledge of Linux/UNIX commands and workflow or worked through "Learn Linux Complete" training DVDs by UNIX Academy. The UNIX Academy Certification Exam login instructions are included in the set. The 30-day period allowed for completion of the exam starts when you first log in. The Certificate will be mailed to you within ten business days. It is the fastest, easiest way to learn Linux System Administration! Guaranteed. Do you need to learn Linux fast? A major obstacle for newcomers to Linux is the steep learning curve of command-line workflow. This is designed to be training and certification solution! This "Complete" version of the "Learn Linux" series provides the motivated beginner with everything needed for training! It includes a complete set of efficient "Learn Linux" and "Learn Linux Networking" video courses on four DVDs, corresponding certification exams, the "UNIX Academy Training Library" with 52 books in PDF format, and printed Quick Reference Card of Linux commands. The set also includes complete DVD Linux installations (for both 32-bit and 64-bit systems) of the newest version of the Linux operating system. Never before has real Linux training been so complete and so affordable! "Learn Linux" is an outstanding training and self-education resource that allows you to learn the most in the shortest time. This suite contains four courses of renowned training and the opportunity for UNIX Academy Certifications. The set is designed with one goal in mind: to help you gain knowledge of UNIX commands and concepts that constitute the core experience of a well-trained Linux and UNIX user. It teaches (and tests) subjects that are central to one's ability to make educated system and network-related decisions. This certification establishes a firm groundwork from which you can continue to develop your skills as a Linux/UNIX System Administrator. After passing the test, you may claim that you have a good understanding of Linux/UNIX system and networking. This course is built around tools common to any UNIX flavor. The UNIX Academy Certification Exam login instructions are included in the set. The Certificates will be mailed to you within ten business days.